Standard - $334.99 Only 1 left! Gruesome is the perfect word for this costume. This isn't just a giant bat costume. This is a giant bat costume if the bat was hit with some gamma radiation and started mutating uncontrollably. Like we said: gruesome. This bat is seriously unwell. He shows up at a party and all his bat friends are really uncomfortable. It's obvious that gruesome bat has gotten into some really dark trouble lately, been running with some bad crowds and his luck is running out, things are catching up with him. But he just shrugs it off, saying he just hasn't been sleeping well lately. Yeah right, gruesome bat! Look at you! Your mouth could eat a subway five dollar footlong vertically! That's not natural, man. Seriously, you need to get help. Your hands look like you've got some serious CDC-level gout, man. Your ears look like you stole them off an elephant. Oh and your eyes are glowing orange with evil. We think you're going through some messed up things, gruesome bat. That's why this is your intervention. 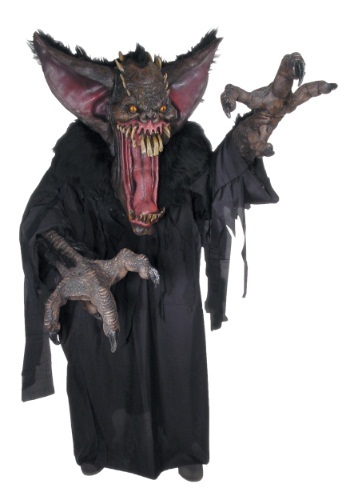 Fortunately, gruesome bat isn't real, he's just a costume. Because if he was real, obviously his friends would have organized an intervention already. But you can rest assured that when you put on this costume, you won't be confronted by concerned bats. Instead, you'll be confronted by screaming, frightened people, convinced that a giant, mutated bat is about to eat them. Which is good, because scaring people away is much better than dealing with a bunch of concerned bats. You don't even speak bat, so how awkward would that be, right? Take care of yourself, gruesome bat. You'll be good as new soon enough.